Pop outfit Scooch are gearing up for their trip to Finland to represent the UK at this year's Eurovision Song Contest. The group were reformed especially for the competition after they split up following several chart hits in the late 1990s. Scooch's Natalie Powers answered questions from BBC News website readers about their chances of winning the contest with their airline-themed song Flying the Flag, and the group's future plans. I have always been a big fan - how did you feel when you were shot back into the limelight? It's great, we're a lot older and wiser now - we were all happy and settled in our own lives and then this came out of the blue. How did you become nominated to take part in Eurovision and did you write the song yourself? Bandmate Russ (Spencer) came up with the idea and wrote the song with one of the producers from our first album especially for Eurovision. We were the only band on Making Your Mind Up who were not a signed band. We were the underdogs at 12/1 for Making Your Mind Up - quite a few people made money at the bookies! Let's just concentrate on Eurovision for now. We've signed to Warners, the single is out on 7 May. It's good to just focus on the contest itself and cross each bridge as we come to it. Do you think the UK will win this year? I think we've got a really good chance. Lots of people have been coming up to us saying it's the best Eurovision song for years. We're really really excited about going to Helsinki. We haven't got any control over the politics. If I was voting, I'd just vote for the song I like best. Our song is fun and catchy, with the costumes and everything, so we just hope it stands out. Yes, I think for France, Spain and Germany - we thought it might get us a few more votes! I don't feel nervous. I was so nervous for Making Your Mind Up because we hadn't done anything together for such a long time - I've watched shows like The X Factor and thought, 'I could never do that'. Now we've got the UK behind us, it's really nice to know you're there by public vote. Now it's time to enjoy it and sock it to 'em! I've heard some of them. I like Denmark's song by drag act Drama Queen. They're loving it! I've heard a group of air stewards have got our song on their ringtone. My sister-in-law is an air stewardess. We want to leave a bit of a surprise for the big night, it won't be exactly the same as on Making Your Mind Up. So watch out! Since you're going to be looking for votes from the rest of Europe, will you be changing the aisle trolley flags from the Union Jack to European flags? We're not using the Union Jack - it's not been decided yet but we'll either have big screens flashing the different flags like in our video or we'll have different flags on our trolleys. Yes, we had a drink after the show, she is really, really lovely. There was such a lot of confusion, I don't really think she knew what was going on. I don't think she realised. What is your favourite moment from Eurovision? I love Save All Your Kisses for me (Brotherhood of Man) and Abba - my son absolutely loves Abba. Do you see Eurovision as a serious competition? We do take it seriously, even though it's a fun song, we would love to win. Scooch's single Flying the Flag is out on 7 May. 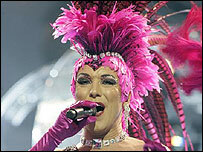 They will represent the UK in the Eurovision Song Contest on 12 May, which will be shown on BBC One from 2000 BST. Scooch's Natalie Powers was talking to BBC News entertainment reporter Emma Saunders.